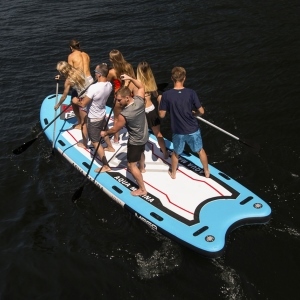 Team Building, Team Bonding and Large Group, On-Water Activities and Events in: Amelia Island/Fernandina Beach and Jacksonville, FL; Atlanta, GA; Greenville, SC; and Grand Rapids, MI — using Kayaks, Big Canoes (25′ long, 10-paddlers each) and Giant Stand-Up Paddle Boards. 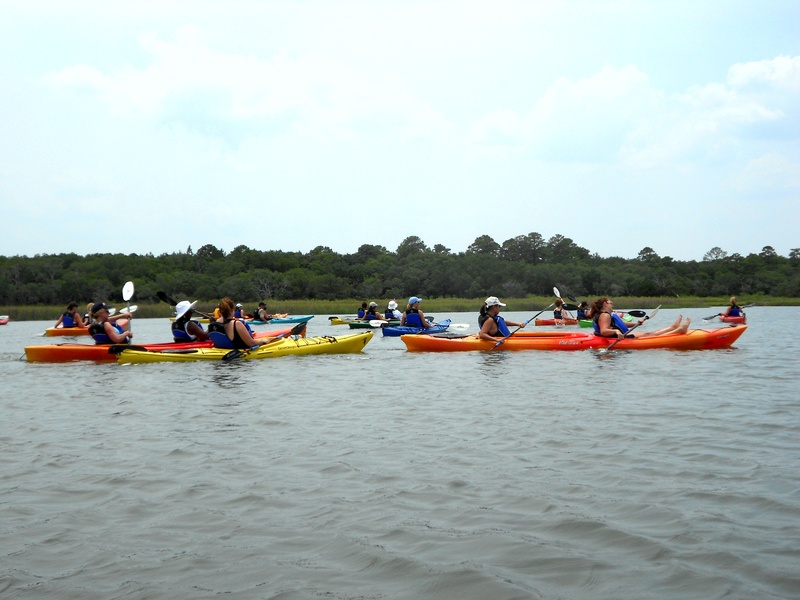 Large Group Kayaking adventures will take your group out of their daily routines and comfort zones and allow them to share an experience that is often a first-time proposition for many of the participants. The fun and laughter begin immediately and the entire experience is all-natural, organic and interactive — creating lasting memories and strong connections between participants. Using primarily tandem kayaks, teamwork is required on many levels with natural challenges built-in to the activity of tandem kayaking — and some not-so-natural challenges added for participants who think they’re up to the task. When people share a new experience, or work together to solve a problem or overcome a challenge, teamwork is fostered and relationships are built. 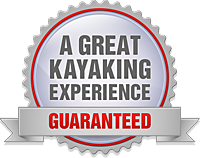 Kayaking is indeed a new experience for most people. And, even for those who have kayaked before, kayaking with a group – as part of a team – is an excellent opportunity to learn to work together in a fun, low-stress environment while experiencing nature in a truly unique and exciting way. Without exception, our guided kayak trips and team building events begin with several individuals learning a new activity in a natural setting – and they end with one group sharing laughter and stories about one of the most rewarding experiences of their lives. Even without a team-building agenda, group kayaking is the perfect team-building evolution and one of the best ways to build memories and bonds that will truly last a lifetime. 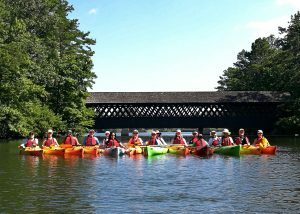 If you’re looking for the perfect idea for a group outing, team building activity or other corporate events, a guided kayak trip is what you seek. 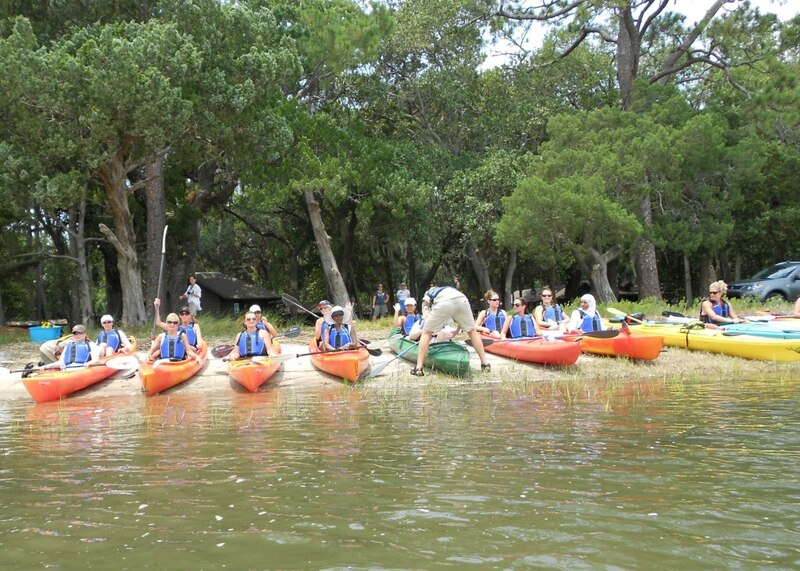 Whether an incentive or reward for a group, a wellness or stress-management outing or a team building experience, a guided kayak trip with our professional staff is the ultimate group activity for visitors to the coast — and a great way to bring groups together. Our guided kayak trips and team building events and activities help people and groups learn, grow and find the mindset and tools to work through new experiences effectively — both as individuals and as a team. In a safe and comfortable environment, your group will find it fun and easy to try new things and open their minds to new ideas and effective ways of thinking and working together. Contact our staff for details or to schedule your next event. 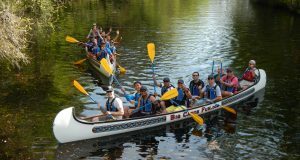 If you’re a meeting planner and you are already working with a destination services coordinator, simply ask them to make sure paddling and team building is on the list of available activities and we’ll coordinate with them to ensure your group has an ideal on-water experience. 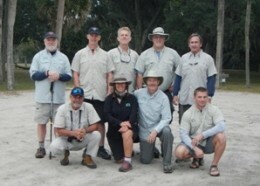 Most of our exclusive, on-water team building events and activities range from $75.00/person to $165.00/person. To start planning your next group outing, email us at: info@UpTheCreekX.com with the date, time, location, number of participants and desired activity and we’ll check availability and get your team on our calendar as we work on the logistics of a customized event for you. 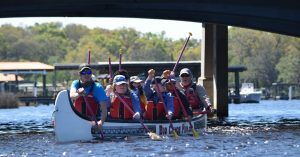 We offer all of our Team Building and Team Bonding activities and events in: Amelia Island/Fernandina Beach, Florida; Atlanta, Georgia; Greenville, South Carolina; and, Jacksonville, Florida — and we’ve traveled as far as Michigan to do a corporate event with the Big Canoes. To start planning your next group outing, email us at: info@UpTheCreekX.com with the date, time, location, number of participants and desired activity and we’ll check availability and get your team on our calendar as we work on the logistics of a customized event for you.